And that was how Lily ended up paying the price for my stubbornness/ineptitude and racking up her first thousand miles on American Airlines. Given that her only previous travel had been from the mean streets of Baltimore to the rescue where I found her (and an Uber from the rescue to my apartment), this was an incredibly unpredictable experiment. But surprisingly, with a little preparation, even sometimes-skittish Lily took to the jet set lifestyle almost right away. Based on my experience, here are a few protips to ease your experience. 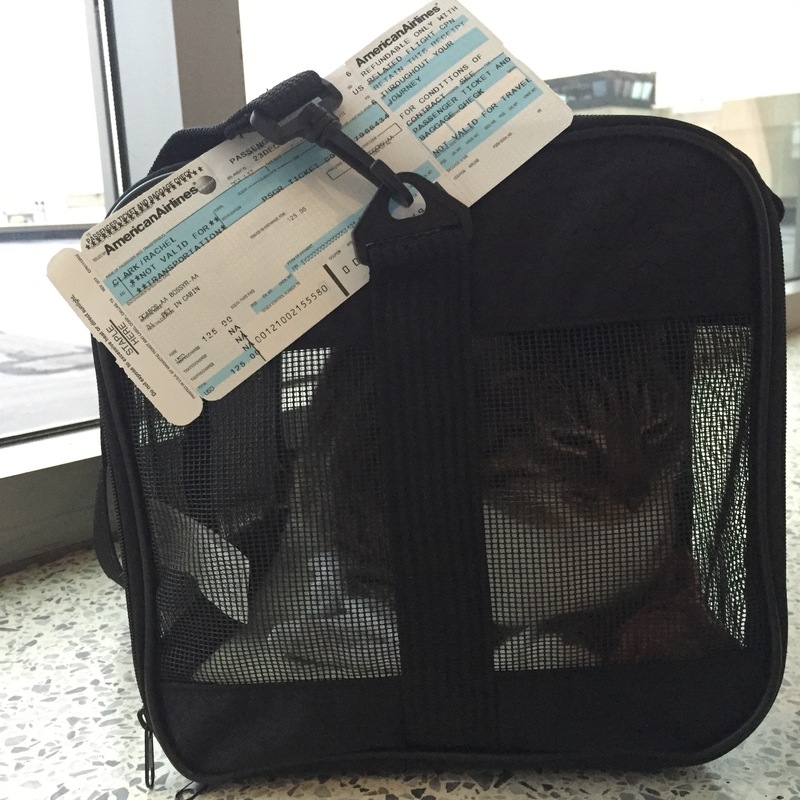 Some might seem obvious, but advice from firsthand accounts of kitty flight experiences was super helpful to me when planning my trip, so I figured I should throw in my two cents anyway. Get the right gear. Not all “airline-friendly” carriers are created equal—some will say they’re designed for air travel even when they way exceed the measurements an airline will accept. Unless you have a monster of a cat, Sherpa’s Small Original Deluxe carrier has plenty of room and it easily fit under the seats on all three of my flights (one of which was on one of the tiniest puddle-jumpers in American’s fleet). Other supplies: A harness (to hang onto when you take your cat out to go through security), some food (though Lily wasn’t interested en route), a container for water (also uninterested), and a t-shirt or something with a comfortingly familiar scent to line the carrier. As with most things, practice makes perfect. Taking Lily on a couple of test runs around the apartment in her harness the week before we left made her slightly more accustomed to/less hateful of it (and helped me figure out how to get a firm grip on it so she couldn’t cut and run at security). I also put her food dish inside her carrier that week to help her warm to it a bit. Hold off on breakfast to avoid, uh, poorly-timed excretory activity. After scouring the internet for cat travel advice, I hid Lily’s food five hours before we left for the airport and put away her water two hours later. Supposedly cats will avoid going to the bathroom in an unfamiliar setting anyway, so maybe that didn’t really matter, but either way, we made it to New York with a clean carrier. Schedule with the cat in mind, even if it costs a little extra. When I booked my flights, I didn’t know I’d have a traveling companion, so I saved a few bucks by swinging through Boston for an afternoon on my way north. A couple of hours at an airport bar isn’t the worst thing in the world. But it quickly becomes less-than-desirable when you add an animal into the equation. And even more so when fog delays your connecting flight for a few hours. Have a connection? Have a plan. I scouted out family restrooms around Logan before leaving DC. When I landed for my layover, I went and found one in a deserted part of the terminal, locked myself in, and let Lily out of her carrier to roam around for a while. This was also a good chance to offer her food and water (even though she rejected it). Even if you think you’ve planned every detail, things will probably go wrong. On one of my flights, the person seated in front of me had an emotional support animal with her. A dog. A big dog. Which wasn’t in a carrier because it was licensed as a support animal. And which was really interested in trying to visit with Lily. Kind of hard to anticipate something like that, but we still made it home intact. I’ll admit I was more than a little nervous about traveling with Lily. Even a year after coming home (her adoptaversary is this week! ), she can still seem nervous at times. She’s also not the world’s biggest fan of being held for more than a few seconds, so the idea of trying to hang onto her in a busy airport security line was mildly terrifying. And she can be very talkative, so I worried about her yelling at everyone throughout the flight. Luckily, though, she was calm going through security, and aside from a couple of meows as we walked down the jetway for our first flight, she was quiet for most of the day. She mostly just seemed to like looking out the big plate glass windows at DCA and Logan, and she definitely enjoyed arriving at my parents’ house, which I think she saw as a massive playground (so many shelves to jump on! and unlike my apartment, it even has stairs!). Every cat travels differently. But Lily is proof that even a skittish little weirdo can take to the air with ease. 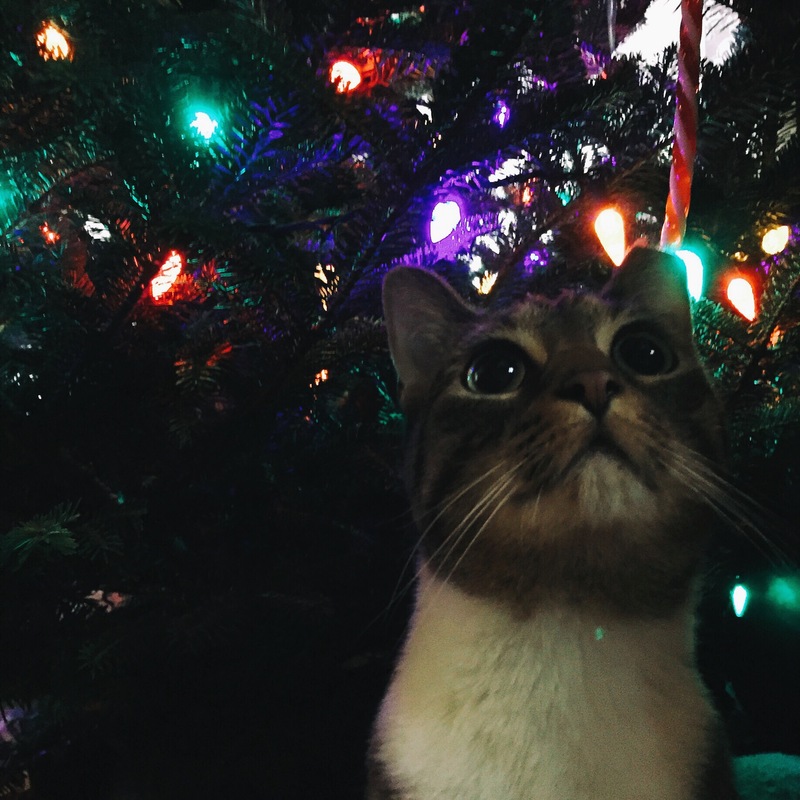 The cat is so cute!!! Oh wow—good luck, Adrien! That sure sounds like an undertaking. Will that be a long flight? Maybe even with a transfer.. So long than i thinking to go by car from France to Russia, or train.. it can be a funny trip too.. less stressfull than plane for sure!